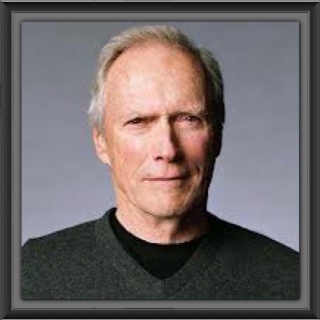 I must admit I haven't seen any of Clint's early spaghetti westerns. I know - terrible me! My first proper encounter with Clint as an actor and director was in The Bridges of Madison County, so it's safe to say I joined the Clint Eastwood fan club quite late! I think Clint is a phenomenal director. He does alright as an actor, but in my opinion his true talents lie in directing. I've read that he has a unique way of running a set - he doesn't yell 'Action' or 'Cut' because it might interrupt the actors' concentration; he trusts his actors to be well prepared and ready to shoot when they arrive, so he generally only does one or two takes (if the actor makes a mistake it will probably be in the film! ); he creates a quiet and safe environment for his actors to just 'go for it'. All of that sounds like the work of a confident director who knows he can bring out the best in his actors. That's the sign of a brilliant director. 3) Invictus - sure this film is a predictable melodrama, but it's handled well by Clint to create an inspirational and hopeful film about unity. I think Morgan Freeman and Matt Damon did pretty well with their South African accents. In my opinion, Clint managed to bring out solid performances from both actors. This might be a sport film, but it is in fact a lot more. It's a film about forgiveness and it reminds us just how courageous a man Nelson Mandela is. I especially liked the film's use of the inspirational poem 'Invictus' by William Ernest Henley. The final lines resonated with me - "I am the master of my fate. I am the captain of my soul." 2) Million Dollar Baby - in a boxing movie that really isn't about boxing, Clint tells a heartbreaking tale of two people who change one another's lives. It's about relationships and regret. It's about two troubled souls forging a bond that can save them both. Clint is excellent not only in his acting role, but also in his accomplished direction which brings out the true heart of this story. He creates a believable closeness between his character and Hilary Swank's Maggie. It's a beautiful film. 1) Mystic River - a powerful film about family, friendship, and the lengths some will go to to protect those they hold dear. It's a chilling story about people haunted by the past and Clint did a magnificent job to create on film the real harrowing darkness of this tale. It's brutal and heartbreaking and so well acted by Sean Penn, Tim Robbins and Kevin Bacon. This film sent shivers down my spine - that's how absorbed I was in the tragic, bitter, at-times-evil story about flawed human beings and immoral acts that can never be undone. It's a masterpiece and a fine example of Clint's superb directing skills. I also haven't seen his westerns but I'm an avid fan of Mystic River - brilliant. Not a big Million Dollar Baby fan but it's more to do with the plot, directing is still a stand-out. Mystic River though - my fav!